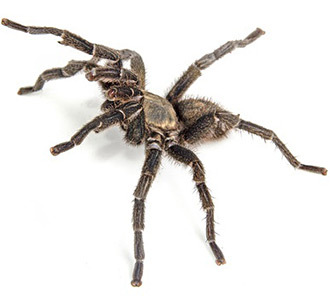 Whether it is because they are so alien and fascinating, because they are a novelty or because they terrify anyone who comes into our home; tarantulas make popular pets and are owned by many people. That means that a lot of us get the privilege of owning a pet that we otherwise would be unlikely to ever come across in the wild, and that can be quite a challenge as we have no basis for comparison and looking after them is far from common knowledge. Here we will discuss tarantula care and what it takes to look after such a strange and interesting creature. The first important thing to consider about tarantula care is that it will differ depending on the specific type of tarantula you are keeping. There are many different species of tarantula and they also vary greatly in terms of their height, weight and diet. The first golden rule of tarantula care then is to research your pet heavily before you begin and not to attempt to generalise rules of tarantula care. However, without knowing the precise type of tarantula, it is possible to get some insight into what tarantula care will generally involve. Firstly then you will need a container that is able to compensate for the size of your tarantula and that will give them some space to explore – though they do not need a very large area to be happy. At the same time the container should be glass so that they cannot get their legs through the gaps in wire mesh. This brings with it more challenges – firstly making it even more important to keep them out of heat and sunlight that would otherwise be magnified by the glass, but also meaning that you need to ensure the top is sealed while still providing air holes as tarantulas can easily climb glass and would otherwise escape. Aquariums are generally suitable as containers for tarantulas though you need to ensure that the lid is fully sealed and that there are no holes large enough for an escape attempt. At the bottom of the container you will then need at least a couple of inches of substrate. The reason for this is that it will absorb moisture and prevent the tank from ever becoming too dry which is bad for tarantula care. This could be anything along the lines of an organic potting soil. As well as this you will also need to supply a water source for your tarantula which can be simply contained in a water bowl that you might find for a rabbit, and decoration for your tarantula that are again specifically chosen to suit its exact breed and mirror its natural dwellings. This might involve stones then, or bark and sticks, others might benefit from a simple piece of store-bought driftwood. Finally you will of course have to feed your pet tarantula and this is fairly inexpensive and easy though some may be squeamish about this aspect of tarantula care. While as a rule tarantulas are ‘insectivores’ meaning that they survive on insects, others have been known to eat small mammals, birds and lizards. This will mean buying hosts of small insects or animals in bulk – often live – and then manually feeding them to your pet. Of course while some find this off putting, others will find it fascinating, making tarantula care very much an acquired taste. With this basic overview of tarantula care you will know what to expect and how much effort is involved in looking after such a large spider. In general it is a fairly easy pet to maintain though it does have a few unique quirks. Ensure that if you go ahead you look into the exact breed of your pet in more detail and prepare appropriately.